Back when I was a sad little jewelry maker, I dreamed of creating colorful enameled pieces. Said dream fizzled for reasons ranging from all-out fear to lack of what I thought would surely be expensive supplies. How I wish I had been able to read this book. Torch-Fired Enamel Jewelry by Barbara Lewis of Painting with Fire Artwear is written in what I like to call "Lori speak". It's as if we're having a face-to-face conversation and Barbara is backing her explanations up with gorgeous pictures, detailed instructions, and creative projects. She succeeds in removing the fear and replacing it with a serious yen for enameling supplies. "...this is not a book about complicated interactions between atmosphere and oxides. Rather, it is a practical book of 'do this and this will happen.'" So, what's included in 128 pages? Barbara begins by explaining exactly what enameling is, the metals used, and how to conquer that scary flame! She moves on to discuss your workspace and necessary tools. Barbara takes you through the torch-firing process, finishing with useful tips and troubleshooting advise. And let's face it, if you're like me - clear instructions, photographs, tips, and troubleshooting are golden! The basics such as jump rings, s-clasps, and making earring wires. More advanced applications such as torch-fired headpins, copper etching, and heat riveting. 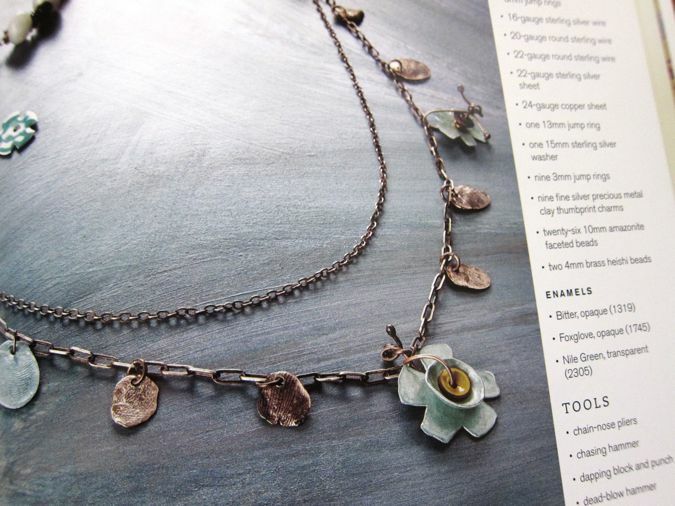 After covering techniques, Barbara provides 22 torch-fired enamel projects with, again, detailed instructions and photos. 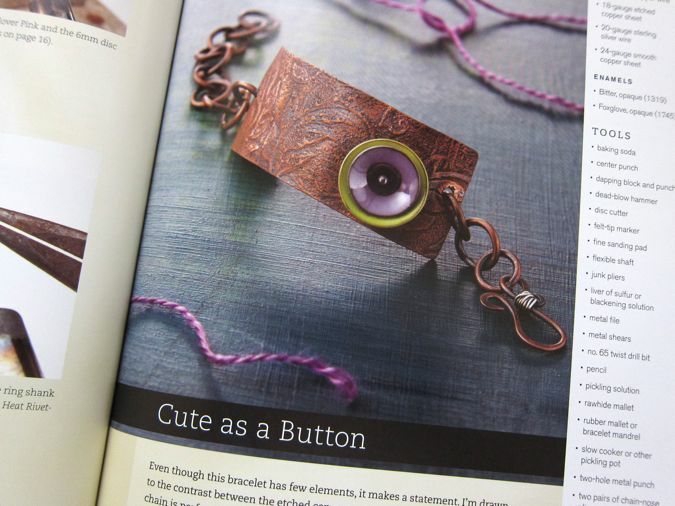 One of my favorite projects is the "Cute as a Button" bracelet shown above. I love this because of it's bold simplicity in addition to the vividly colored enameled pieces paired with etched copper. I'm also loving the pale colors and delicate nature of the "Aqua Ice" necklace shown below as well as another sweet little number called "Of Space and Time". To see "Of Space and Time", you'll need to pick up this new book! Torch-Fired Enamel Jewelry on Amazon. Yes, dear, they will bring it right to your mailbox! What more could a girl ask? Yep, this baby is on my wish list. Thanks for the wonderful review and eye candy! Love this book, pre-ordered it and will take it with me to get it signed when I see Barbara in Portland, just over 1 week away!! Woohoo!! Yep, this was a must have addition to my library! Haven't had time to play properly yet, but I've devoured the book. Great review, and I love that bracelet too! Wow, that's a great review Lori. Definitely need to add this one to the library! Enjoyed reading your review. I have the book and the kit and am a Barbara Lewis follower, and now one of your followers. 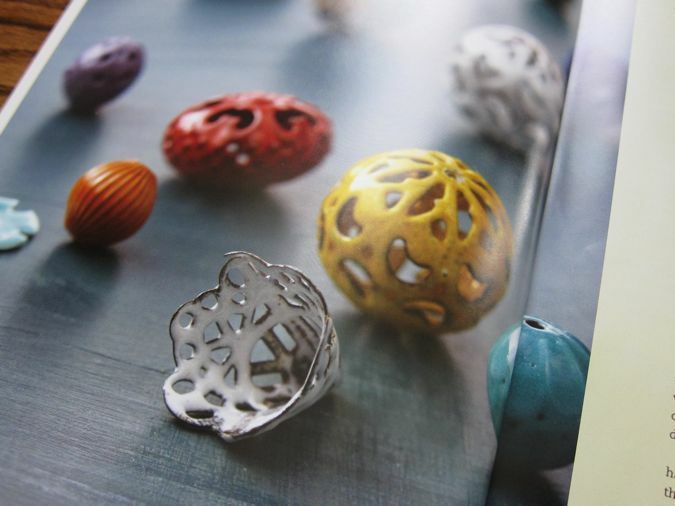 Love what you do with the enamelled items! I enjoyed reading the review of Barbara's book which I already have along with her kit. My first effort didn't come close to matching yours! I am a follower of Barbara's blog and now yours! Love what you did with the enamelled items!